The 52nd annual Fleur du Cap Theatre Awards today announced its nominees. These annual awards are amongst the most coveted in the South African performing arts fraternity. This year’s ceremony will take place on Sunday, 19 March at 18:00 at the Artscape Theatre in Cape Town and promises an evening that is ‘Alive with Flair’. For over 50 years the Fleur du Cap wine brand has proudly associated itself with the Theatre Awards as they showcase the flair that is synonymous with the wine. “The awards enable us to support theatre-makers who offer moments of freedom and purposeful expression,” says Distell Luxury Brand Director, Carina Gous. Both the Fleur du Cap wine brand and Theatre Awards have played a significant role in the lives of South African theatre-makers through awarding excellence in professional theatre. Winners are chosen from productions performed at professional theatre venues in and around Cape Town. Theatre practitioners are recognised for their acting, directing, staging and technical abilities. These nominations reflect the exceptional talent seen on stages last year, and which kept audiences coming back for more. The awards are considered in 20 different categories including awards for the Lifetime Achievement and Innovation in Theatre. The recipients of the latter two will be announced at the ceremony next month. A total of 85 productions from the year under review were eligible for consideration. Unfortunately an insufficient number of student productions could be adjudicated last year and consequently the award for the Most Promising Student will not be made. Similarly, no award is being made in the category for Best Puppetry Design. The judges for the 2016 productions were Africa Melane, Dr Beverley Brommert, Christine Moritz, Eugene Yiga, Johan van Lill, Marina Griebenow, Niel Roux, Steyn du Toit and Tracey Saunders. It was an exhilarating year in our theatres, where real life and art became interchangeable. “The stage was set for expressions of individual and collective stories, without which we would not be able to celebrate excellence in theatre. Thank you to Fleur du Cap wines, the hardworking panel of judges, theatre-makers and all the creatives behind the scenes who made this possible,” says Melanie Burke, chairman of the judging panel. For a production to be eligible, a run of a minimum of eight performances over a period of three weeks at the same venue is required. Each award carries a cash prize of R15 000 and is accompanied by a silver medallion. All voting processes are audited and overseen by the legal firm Cluver Markotter Inc.
Tickets sales for the awards ceremony at the Artscape Theatre, open on March 01, 2017 via Computicket (0861 915 8000) and is R250 per person. 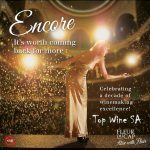 Share your Flair with Fleur du Cap wine and celebrate excellence in theatre with the award recipients!